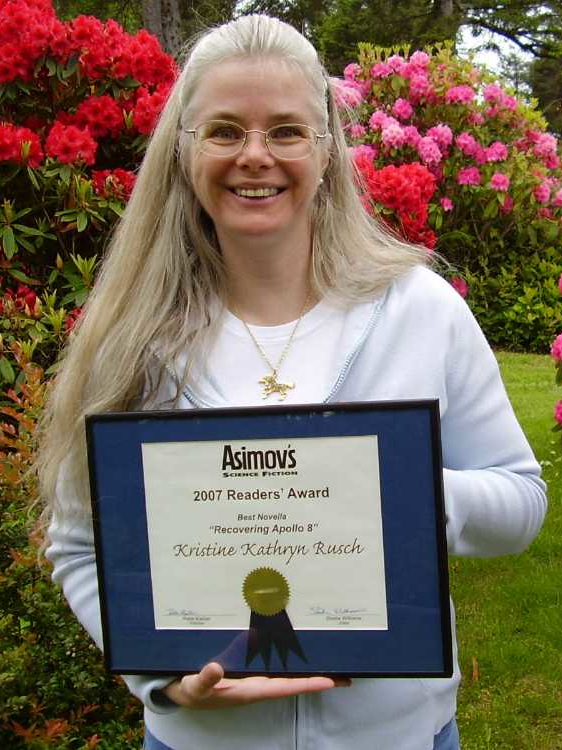 "The Wedding Ring," by Kristine Kathryn Rusch, in Ellery Queen's Mystery Magazine, March/April 2018. This is Rusch's sixth appearance on this site. I try to treat all my little darlings equally, rooting the same for every story I read but I admit that sometimes a concept or opening is so strong I find myself cheering the author on: Keep going! Don't screw this up! Rusch didn't screw it up. Here is the concept I liked so much: Serena is a classics professor and after a bad breakup she goes to Las Vegas for what she calls her Liberation Vacation. There she meets the man of her dreams. Shortly after that they are married. Shortly after that he disappears, taking her cash, self-confidence, and so much more. One cop says about the crooks: "They're not in it for the money. They're in it to destroy their marks." "Crossing the River Styx," by Kristine Kathryn Rusch, in Alfred Hitchcock's Mystery Magazine, November 2014. They'd left, all of them. They'd left, taking the light with them. Now Edith huddled in the darkest place she'd ever been in, her face, hands, and shirtwaist soaked with blood. Frank was dead beside her. She'd known that from the moment the shot hit him. Hot blood spurted out of him, coating her, and he made all kinds of groaning sounds. Well. That's an exciting way to start a story, isn't it? The illustration clued me in to the fact that this takes place in the 1920s, which made me think we were in a Bonnie-and-Clyde scenario, but not quite. Edith is a proper young woman on her honeymoon and Frank has taken her to the Oregon Caves. That's where the extreme darkness comes in. Now Edith has to find a way out of the cave by herself (crossing a creek known as, yes River Styx) and figure out whether she is in danger from the men who fought with her husband. The other key viewpoint character is Albert, a mechanic employed by the Forest Service that runs the caves. They will both learn something about themselves before the night is over. As usual, a very good story from Ms. Rusch. 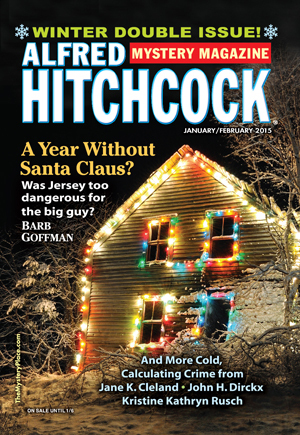 "Trick or Treat," by Kristine Kathryn Rusch, in Alfred Hitchcock's Mystery magazine, December 2012. 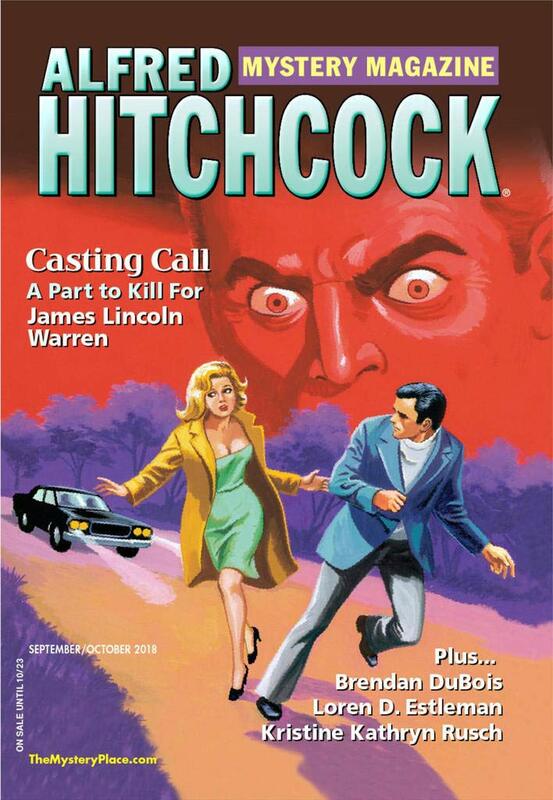 This was a tough week, since Hitchcock featured stories by two of my favorite writers about two wonderful series characters. Mitch Aldeman's Bubba Simms stories and Kristine Kathryn Rusch's Spade/Paladin tales have several things in common. Both feature men who are six-five, and both rely more on character and language than on plot. But there are big differences as well. Bubba is a three-hundred-pound weightlifter; a private eye in Florida. Spade is a four-hundred-pound Microsoft millionaire who uses his money and numbers skills as a forensic accountant to run the finances for science fiction conventions. Spade (that's his nom de fandom, we never learn is real one) has an occasional partner, Paladin, an athletic young woman who is his opposite in physique, temperment, and almost everything except intellect. The reason I chose Rusch's story this time is that it had a more interesting plot than Aldeman's "Eureka." I could see where that story was headed pretty much from the beginning, but Rusch's story took it's time in unfolding. In "Trick or Treat," Spade is working at a convention in San Francisco on Halloween weekend when Paladin asks him to help out by babysitting a troublesome kid named Casper. Spade, well aware that an overweight misfit millionaire hanging around with a child could be misconstrued, grumbles "The worst situations in the world always start with the words, 'trust me.'" But he always finds it hard to resist Paladin. The center of the story is the fat man and the grumpy Casper, both smart and both lacking social skills, trying to establish a productive relationship. Naturally, it involves computer programs. And crime. Both stories are very much worth a read.